Our table size knock your teeth out carnival game is a true carnival game classic enjoyed for years at carnivals around the world. 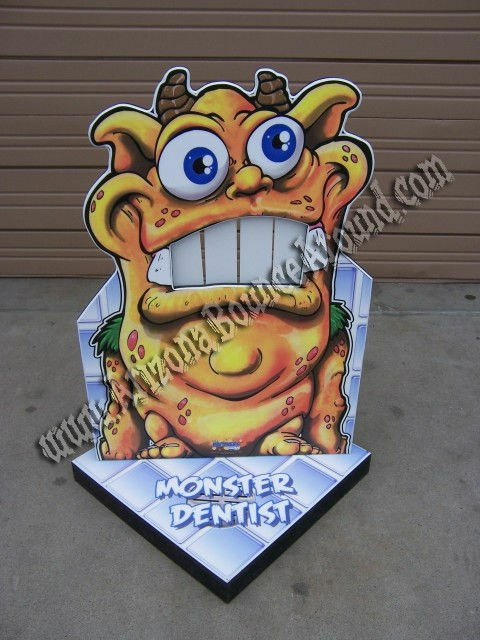 Our knock my teeth out carnival game rental comes complete with its own stand so it can be a freestanding carnival game, be put on top of a table or on the ground. The object of the game is to throw the bean bags and knock the teeth down that are held up with velcro and are on hinges so to reset the game you simply lift up the teeth from the back and they stick in the up position with the velcro so its very easy and fast to play. We offer many different sizes of carnival games for rent and even rent carnival booths and carnival game tents. We are a full service carnival rental super store serving all of Arizona and can even supply carnival rides and inflatable games to fit any carnival themed event. This carnival game is also available for customer pickup perfect for carnival themed parties.